Christmas is only a week away, sure crept up fast. Today is the 18 of December already. We have had so much snow here it's crazy. You can hardly see the Christmas decorations that I put on my lawn, they are a little buried. We have dug them out a couple times but you still can't see them very well. I think I'll be digging Christmas decorations out in the spring cause you won't be able to find them pretty soon if we get any more snow. LOL. It's been great here weather wise the last couple days, warm enough to actually take my dogs for a walk. They have been staring at me a lot, to the point where they make you feel guilty for not taking them. So they have been my motivation to go or maybe my conscience has been. Either way they were happy they got some walks in while the weather has been nice. 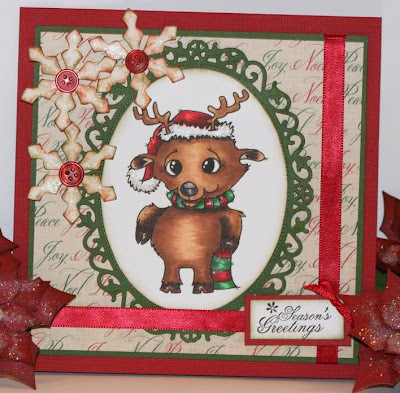 This card is made using a digital image from Whimsy stamps by designer Miss Rach called Winter Reindeer. A super cute reindeer that is great to color and will be great to throw in the mail to someone for Christmas. What an adorable card!! 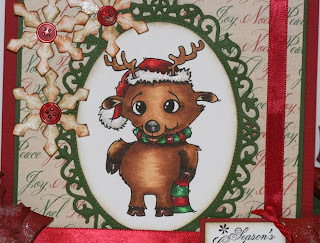 That image is so cute and the buttons on the snowflakes is such a great accent. Thanks so much for sharing with us at Word Art Wednesday. The snowflakes are beautiful and the image is sweetly adorable. Thank you for joining us today at Word Art Wednesday with your fabulous art. What a darling Christmas card. Thanks SO much for sharing it in our challenge this week. It's a blessing to have you play along. Have a blessed and merry Christmas. Way to go friend, love the colors and the buttons add a nice touch. Awesome coloring too! 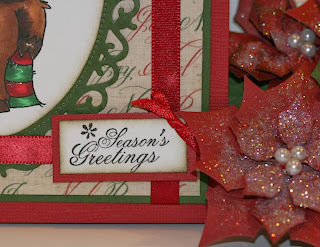 Thanks for playing our Winter/Holiday Challenge at One Crazy Stamper!